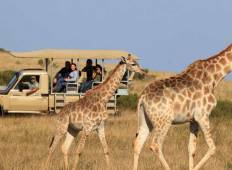 See the top Nature & Adventure trips that go through Wilderness National Park, South Africa. With 22 tours to choose from, they range in length from 3 days to 40. The most popular month for these tours is May, which has the most departures. "The tour was great. Sometimes it was a little bit stressful. Maybe one day more would..."
"Amazing guy. Welcomed us from the first day and trough out the whole journey and..."
"Had an amazing time on the 5 Day Garden Route and Addo Adventure (one way). The trip..."
"I had an amazing experience. Latitude 31 has an awesome itinerary that still has..."